...because if your wedding colors involve pink, red, or both, the next couple of weeks are going to be a bonanza. Valentine's day is just around then corner, and a half a step beyond that is all the Valentine's day sales. If you're a DIYer and the holiday fits your color scheme, its time to start hitting the stores. Just today at Micheal's craft store, a lot of the V-day goods where already being offered at 40% off. On February 15th, you can expect to see anywhere from 50% to even 80% off. But don't wait too long, they won't have it out for too long before they need to make way for the next holiday. Not a red/pink kind of gal? Wait for the holiday that does match your color scheme. You won't regret it! 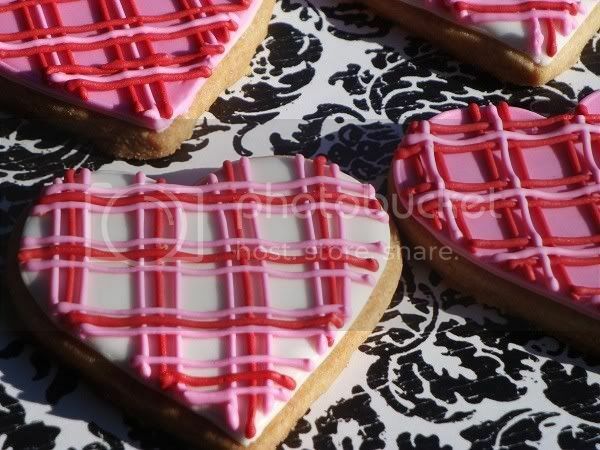 By the way, how cute are these pink and red tartan cookies?? Gotta love Etsy.